Where Did All These Catfish Come From? Client with nice catfish a few weeks ago. 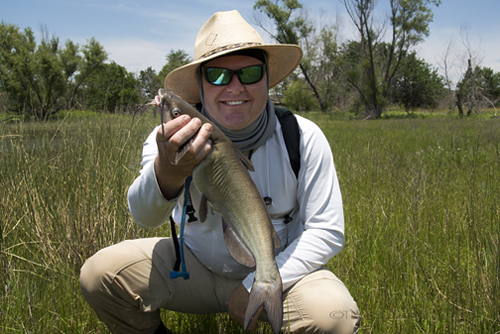 I have been fishing Lake Ray Roberts for some years now, and I don’t know if there is some hardhead plot, or a scientific explanation, or what, but I have yet to NOT catch a catfish every time I fish that lake this summer. Maybe it’s the fact Ray Roberts has been perennially shortchanged when it comes to stocking largemouth bass (compared to the smaller more famous Lake Fork), that gives the catfish population room to grow. I would certainly like to blame it on that, but then we know that can’t be right. It’s probably just that their food sources are abundant in close right now. The craziness of catching catfish, I documented a couple of weeks ago, could be repeated as I do see hoppers floating by as usual. Well, actually they are surfing on some pretty big waves. If that wind dies down, you can bet they will be back to stuff themselves with hoppers. There is also an abundance of tiny baitfish, tiny as in shorter than your pinkie finger nail, and maybe that is what is bringing them in close. All I know is, I can safely say these cats are herded in close, and easy to catch – all you want. We even see them in the flats and can sight cast to them just like a carp or bass! And speaking of bass, my last two forays into the flats on Ray Roberts showed me nice largemouth bass back in the shallows, and chasing abundant bait right past me. On my last guide trip I saw the largest free roaming bass that I have ever seen on Ray Roberts – what I estimate to be a double-digit green torpedo – that made my heart skip a beat. Remodeling, relocation, and construction continues on the new fly cave, a combination of fly tying, exercise and every thing MAN CAVE. It’s still under the home roof for now, but has enough room to contemplate rod building in 2013. The autonomous cave has been put on hold due to the new 1200 square foot shop Cimarrona and my steel work now occupies here in Denton. In the background, multitasking if you will, is the idea that the Airstream will be ready in time to locate elsewhere in 2013 as well. I had a shuttle customer for my services on the Greenebelt Corridor last week and you can read his cautionary report at www.kayakshuttleservice.com.